Although you did not say if you used Apple stock driver or NVIDIA Web Download because I noticed that there’s a difference in performance when I tested a GTX 680 in 10.8.4. Perhaps something changes when the final build comes out, or even with DP6 (due “real soon”). As a side note, Safari 7 was awesomely fast in DP2 scoring 710+ on the speed-battle.com, and in DP5 it dropped down almost 100 points. Just shows that Apple tunes things back for the sake of stability (slow and steady wins the race LOL, NOT). Since it’s osx 10.9, no web driver for it available. In retail 10.9 all will be the same, maybe only a bit more fresh drivers will be included. However nice result, only severel percents lower then in Windows, but in real games performance is much lower. As an example Geforce GTX 670 is very powerfull for World of Warcraft, but in OSX I need to lower some settings and still I can’t get always 60 fps without drops. Also AA (antialiasing) in OpenGL in OSX is a FSAA mode, but in Windows by default will be much fuster method – MSAA. So it’s better to test without AA to compare results. Can you make a another test with FullScreen, not Windowed ? As i see, OpenGL in Linux is faster then in Windows or OSX-10.9. Don’t know, maybe something wrong with my WindowsH8 (driver WHQL-v.320-49).. Yes, Netkas’s results are too low for GTX Titan, I tested my Hackintosh (Geforce GTX670 1GHz base clock, Core i5-3570К 4.3GHz, 8GB DDR3-2200, Z77 chipset with PCI-E 3.0) and get score “1004” with the same settings. So maybe it’s due dated system, Xeon E5462 is a Core2 Quad class CPU with PCI-E 1.X bus for GTX Titan and it’s devided to both cards, system memory also is an old ECC DDR2 type. I’ll check my config in Windows 7 later today for compare. With Direct3D 11 I got “1125” only 12% faster. I think it’s very strong results for OSX 10.9. Xauron, Geforce cards work as fast as in Windows on modern hardware, so Radeon cards in best case will also show their Windows OpenGL score, which is almost the same then compare competitive models from nVidia and AMD, so Radeon cards can’t be better than competitive Geforce cards in OSX too. But Titan is the fastest single chip card ever for today, so it’s the fastest graphics card for OSX, because OSX don’t support multi-GPU cards. sry my fault… MP4,1 is the first Nehalem i-Core based MP. 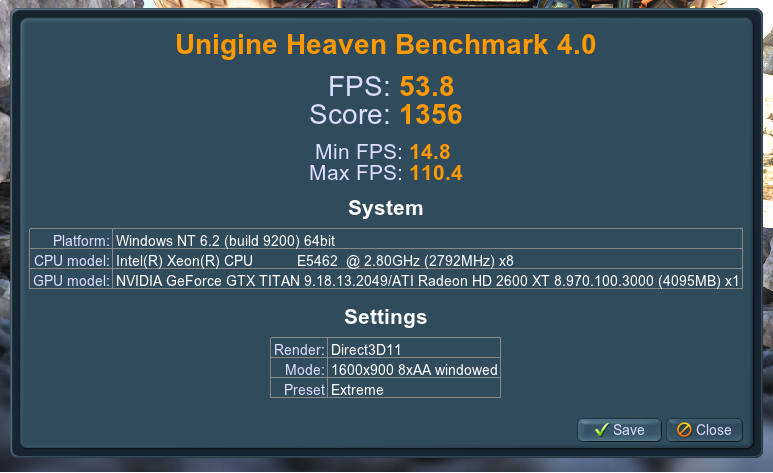 Hey folks, just for comparison sake I did a test of my own with my 7950HD (GA-Z77X-UD5H w/ i7 3770K). Yolanda, I desagree. 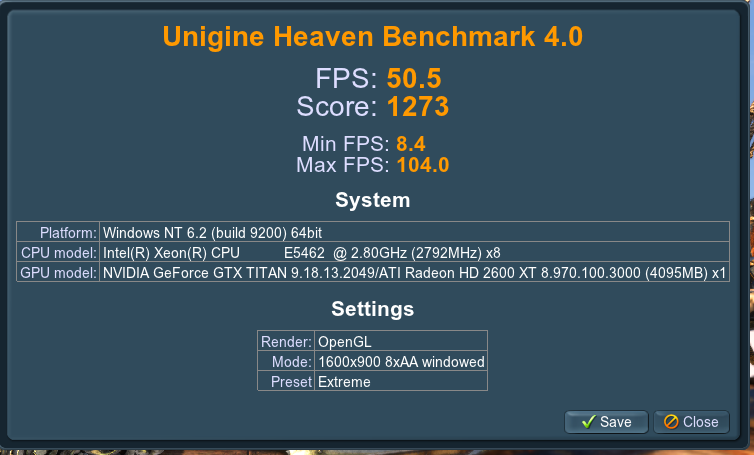 HD7970 in OpenGL apps is much faster than the Titan, even in windows. nVidia is capping the opengl drivers a lot in the mainstream cards, just having big advantages in Quadro Cards. Mainstream AMD cards are much better in OpenGL by default. I work with 3D apps, and I know what I am talking. And I have Quadro card as well. 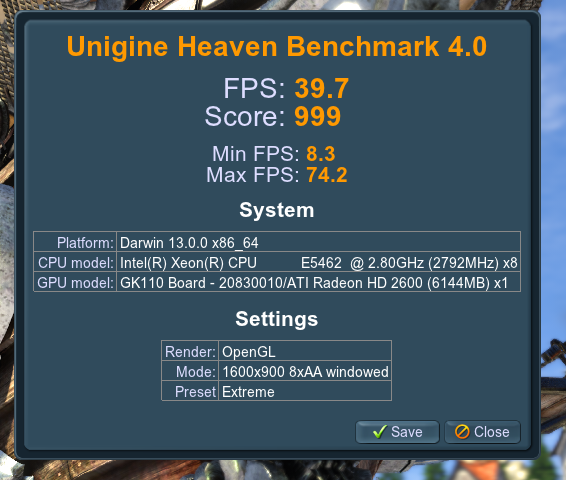 My personal experience with Heaven (on a slow 9600GT laptop GPU) is that results are not much reproducible. I get 10% variation between runs performed after cold starts on the same Mac and OS X version and I don’t know why (no spotlight indexing or anything). Xauron, I say about OpenGL in gaming benchmark, where all features work without penalties. it’s still cayman xt prototype …. forgotten to say…6970 works under windows in world of warcraft by ultra in most cases while os x is 30-40% slower…. Thats some good news as the standard Apple Driver was always extremly slowly as compared with Web-Driver. Here are my results with GTX 580 Classified.